Hunting for the Environment demonstrates that hunters and DOC often have the same goals and values in caring for and appreciating the environment. 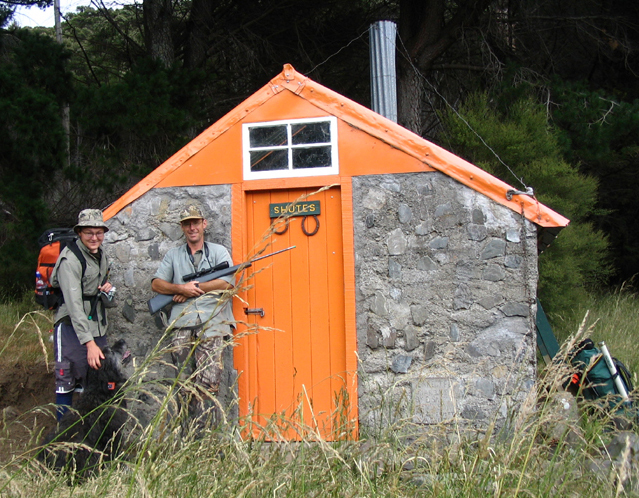 Backcountry hut maintenance is being done by local hunting clubs in the Tauranga area through an agreement with DOC. This is great because it means we can do more, using skills that come from outside the Department. 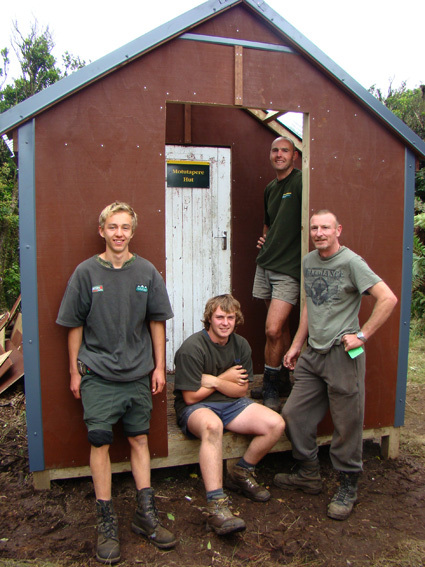 About seven years ago we were planning on removing some of the old Forest Service goat cullers’ huts from the southern Kaimai ranges between Tauranga and Katikati. There are several of these basic huts along the North South Track. No longer in use by DOC staff, these huts were in bad shape and the plan was to simply remove them. One of the local Deerstalkers’ Associations really wanted the huts to stay. So DOC embarked on a relationship that has culminated in several hut upgrades and a community partnership to maintain access to the backcountry Kaimai forests. Deerstalkers love these huts and want to protect them. At the beginning of March this year a working bee was held to make Motutapere Hut weather-tight and improve the facilities for hunters. Members of Thames Valley and Bay of Plenty Deerstalkers Associations worked alongside DOC rangers for three days, removing the old iron cladding and replacing it with treated plywood boards, plus a new roof, porch and chimney. Merlin Rohan (17) and Jordan Ogilvie (18) joined Matt Gyde and Kody Williams from DOC to get the work done. Merlin is from Thames and has worked with DOC before, laying traps in the Kauaeranga Valley. His father is a carpenter so Merlin brings his skills and experience to the job. He told me his favourite part of the trip was the good kai provided by Jordan, who cooked for the lads on the trip. Jordan took leave from his engineering job to help with the working bee and is passionate about backcountry hunting. He told me it makes sense because access to the bush is free, in a world where most things are getting dearer. He said that the feeling of walking all day and finding the hut at the end is a great, great, feeling. He also said that everyone needs to pitch in. Jordan’s worst moment on the trip was waiting for the chopper to arrive, but I think he was pretty stoked when it did arrive to ferry him up to the hut! This is the fourth and final local hut maintenance job in recent times, all of which have been joint operations between DOC and local hunters. Just last year the Kauritatahi Hut (with the finest view from any hut in the district) got a makeover including a new deck, roof and cladding. In addition to helping with refurbishment of the hut, hunters are now helping to maintain the track to and from the hut, and are doing regular hut inspections. Kauritatahi Hut is now getting much more use from trampers, who are taking overnight trips just to sit on the deck and enjoy the view. The hut book was full of entries showing that the hut gets good use despite its ageing character. From now on both hunters and trampers will find these huts much more comfortable. Do you have a favourite DOC hut? What do you like about it? The area around the hut is steep with amazing views of Tauranga Harbour and the Waikato, this steel ladder at the summit is quite a thrill! Thames Valley Deerstalkers are big on community involvement and DOC is better off for working alongside them on this project. Their President Maureen Coleman told me she has nothing but praise for the way DOC staff have responded to them, saying we are fantastic to work with. She reckons the project has built bridges between hunters and DOC, overcoming some of the “communication problems” in the past. Are you a hunter? What do you think about DOC huts? Built as a goat culling hut in the 1970s, Motutapere Hut has been moved several times during its lifetime. 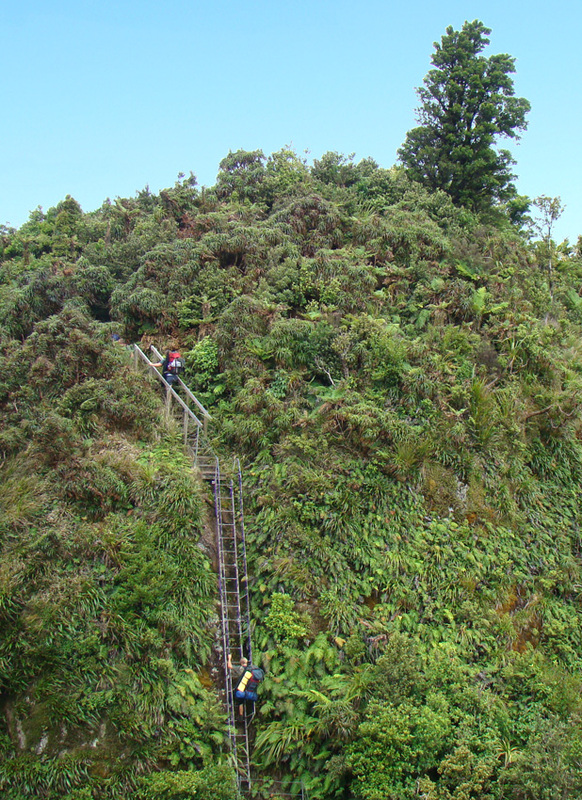 It was sited at Whakamarama and then on the Te Tuhi track to assist with eradication of goats, before finishing at Sentinel Rock which was a hotspot for goats in the mid 1980s. In those days the NZ Forest Service had a full time team of goat cullers for the Kaimai Ranges. How times have changed! The hut has four bunk spaces and a rainwater tank. It also has mobile phone reception! Everyone who has tramped or hunted in the back country knows that feeling; when you clear that last ridge or walk out of that last patch of forest to see the hut just ahead in the distance. Your pack suddenly gets a little lighter and you feel a sudden burst of energy that sets you steaming towards tonight’s home away from home. But as you take off your boots at the front door, have you ever thought about all the others that have done the very same thing before you? That you are the latest player in a history that goes back decades? The back-country of New Zealand contains about 1400 huts, a network unequalled anywhere in the world. And over half of these were built for government shooters. Historic huts are more than just shelter; they are a reminder of the past and a link to our cultural heritage. Deer were first introduced into New Zealand over 150 years ago, to hunt for sport. They spread so far and so fast they became a serious pest. In the 1930s the government (Department of Internal Affairs) started paying shooters to go into the backcountry to reduce deer numbers and slow their spread. It was tough work, both physically and mentally. Some of the earlier huts were built by the deer cullers themselves. Because these huts were built in remote locations, they often used what was on site, using old crafts for the last time like splitting, hewing, pit-sawing. When the New Zealand Forest Service (NZFS) took over responsibility for deer control in 1956, they quickly began creating a network of tracks, bridges and huts for deer cullers who practically lived in the backcountry. The first steel metal huts were cold and uncomfortable, and were soon replaced by the standard NZFS-designed wooden-framed and lined four and six-bunk huts in the valleys, and two-bunk bivs on the passes. Muddy Stream Hut St James Range. Many of these lasted far beyond their expected lifespan and still stand today, used by modern trampers and hunters. They have become an iconic feature of our New Zealand back country and are unique in the world. The deer cullers were admired for the difficult job they did. They became an iconic – almost mythic – figure in the New Zealand landscape, thanks in part to the many books written about their exploits. They played a big part in creating the legend of the kiwi bloke, or as Barry Crump phrased it, the “good keen man”. The hut was an ever-present stage in these books. State-funded deer culling continued until the early 1970s but faded out after commercial hunters using helicopters became more common. However, the legacy of the deer culler lives on, in their huts. Why not plan your next trip to one of these historic huts? Roger’s Hut (1952) One of three remaining slab-beech huts in the entire Urewera Range, built in the winter of 1952 by a team of cullers led by Rex Forrester. Te Totara Hut (1952) is the oldest surviving hut in Te Urewera National Park, also built by Rex Forrester, from split totara slabs. Cedar Flat, (1957) on the Toaroha Track inland from Hokitika was built from a mix of sawn air-dropped timbers and hand-adzed timbers from the surrounding bush. Slaty Creek Hut (1952) Another West Coast hut, built of pit-sawn totara slabs with an iron roof. Dasler Biv (1966) in Mackenzie Basin was first known as Cullers Biv. 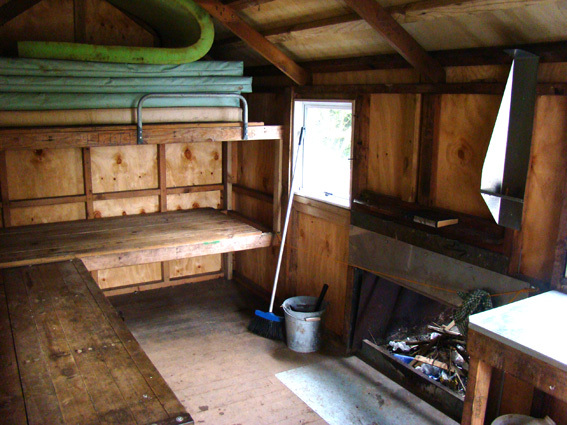 This two bunk hut was built by NZFS with treated wooden piles, flat tin walls and chimney, and corrugated iron roof. 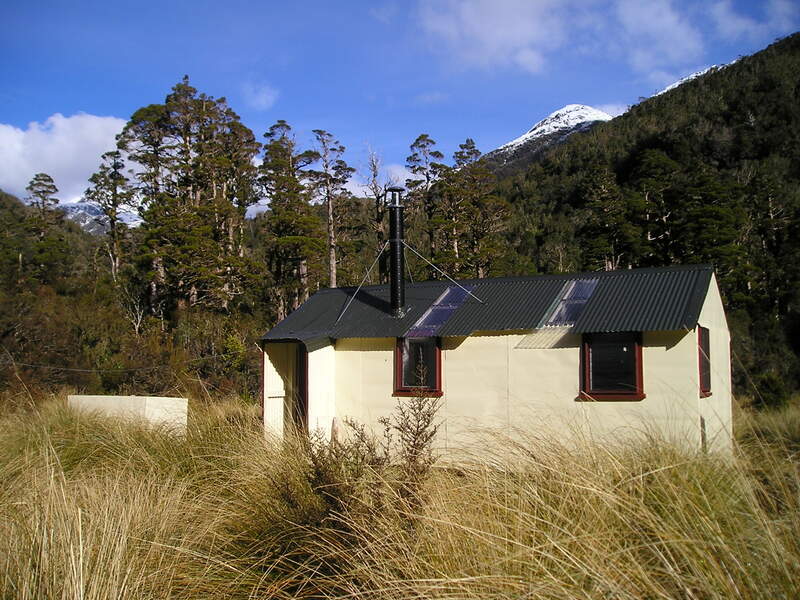 Caswell Sound Hut (1949) is the last physical remnant of the New Zealand-American Fiordland scientific expedition set up to study the Fiordland Wapiti herd. It was built of surplus supplies at the end of the expedition, so it would be used by Wapiti hunters. Clark Hut (1941) the last remaining split beech log hut in Fiordland National Park was built by cullers Archie Clark and Allan Cookson. Archie Clark, the first deer culler in the area, was a local legend, an expert stalker and a crack shot. 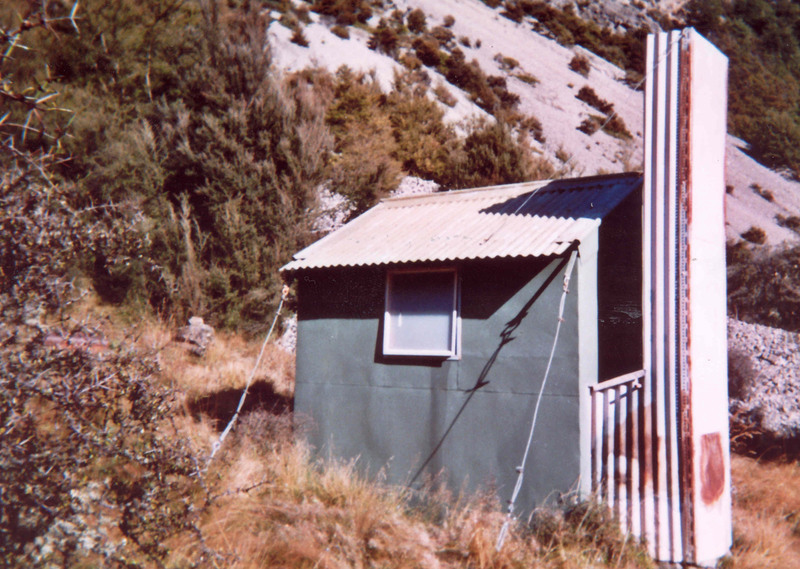 Muddy Stream Hut (1965) was built in the St James range, Lewis Pass. In 2006 DOC donated the hut to Willowbank Wildlife Reserve who restored and officially opened it within the reserve during Conservation Week, August 2006. 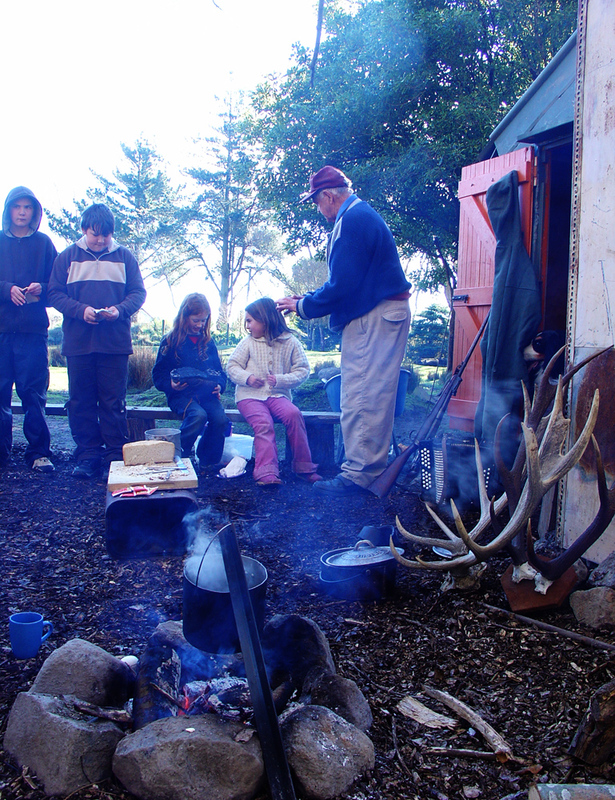 Children hear a tale or two from old deer culler Bill Scott outside Muddy Stream Hut in 2006. Caughley, G. (1983) The Deer Wars: the story of deer in New Zealand (Heinemann). Technology these days.. It’s all about Twitter right? or blogging, High Definintion, Bluetooth.. or some sort of fandangle GPS system that seems to do all the work for us. What happened to the traditional electronics? You know – circuits, soldering irons and LEDs.. All that stuff..